My sister, Halie, is currently part of an exhibition at Untitled Art Society called A Space Ship is Just a Time Machine. The reception was this weekend and she wanted to have an amazing outfit. The pants were already decided on but she wasn’t sure about the top. 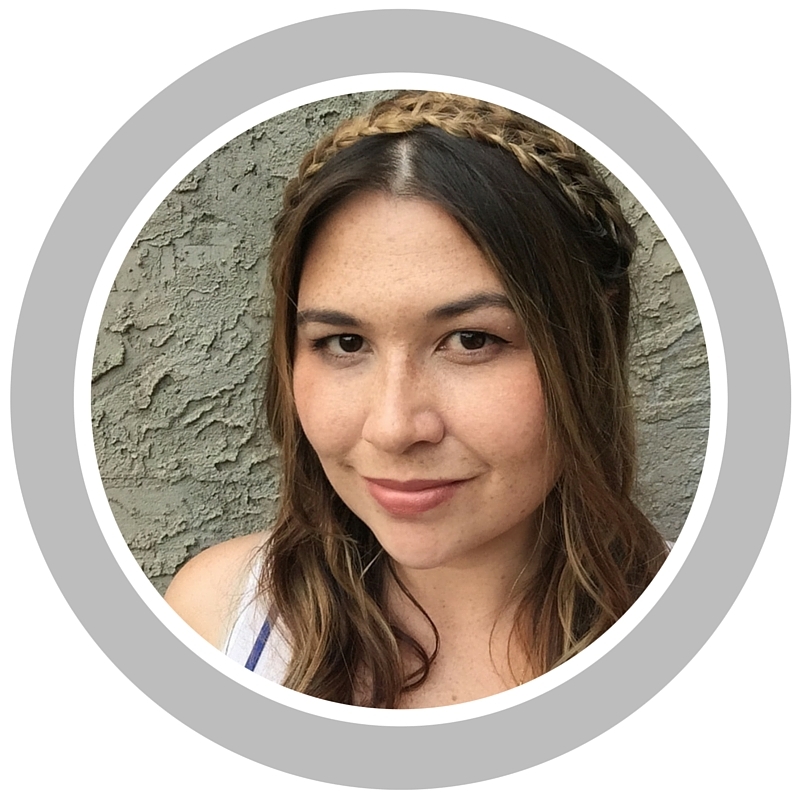 Sewing Sister to the rescue! I had seen a photo that week on pinterest I thought would work perfectly with the pants. 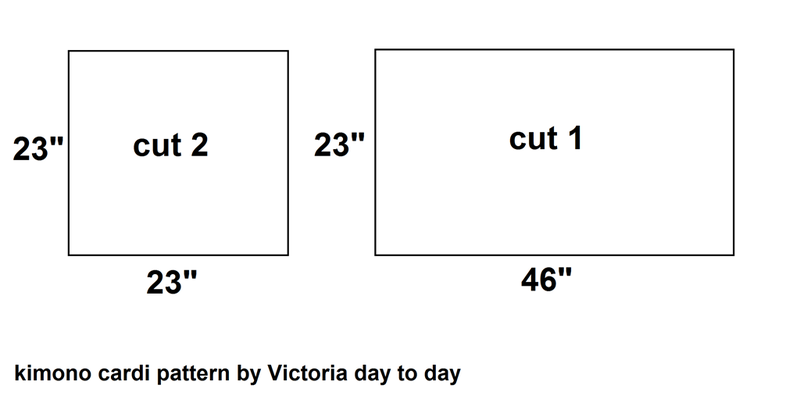 This pattern drafting was very simple and consists of two squares (for the back and front) and two rectangles (for the sleeves). Happily the muslin looked great. Summer is here and hoo boy is it hot! Well at least in Calgary it is. Even though I feel like I’m melting, being over exposed in public is not for me. I may be cooler but I’m not comfortable. Halie, my sister, feels the same way. 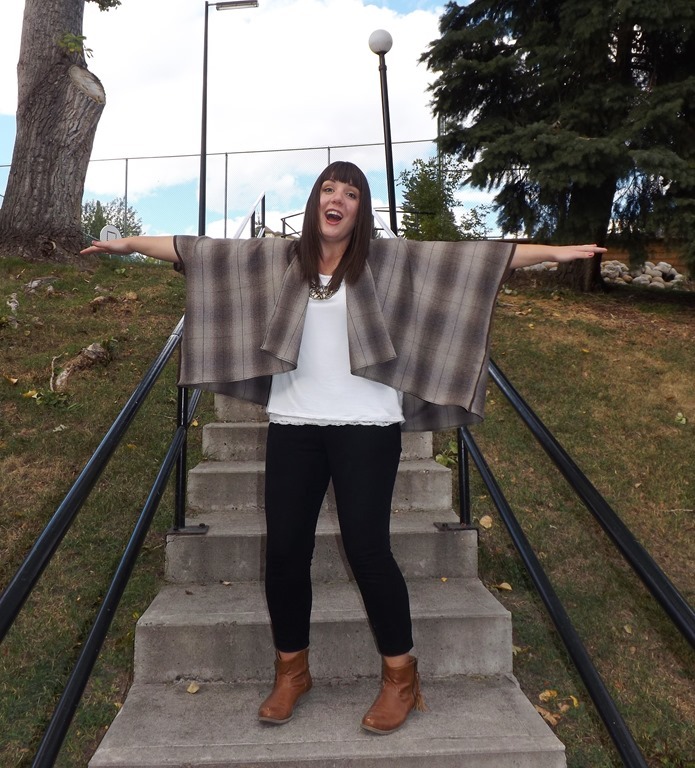 The solution is a light and breezy kimono! She asked me to make her one and since her birthday was coming up how could I say no? The fabric Halie picked out is a vintage Japanese silk which I’ve had in my fabric stash for awhile. It was perfect for this project and I think it turned out great! I tried a different method then my previous kimono tutorial and pretty much just winged it. Luckily it worked out on the first try. I’ve found a tutorial similar to what I did on Babble by Merrick White. The only difference is since the kimono I made is longer I didn’t sew the side seams all the way down, only to about mid-thigh. 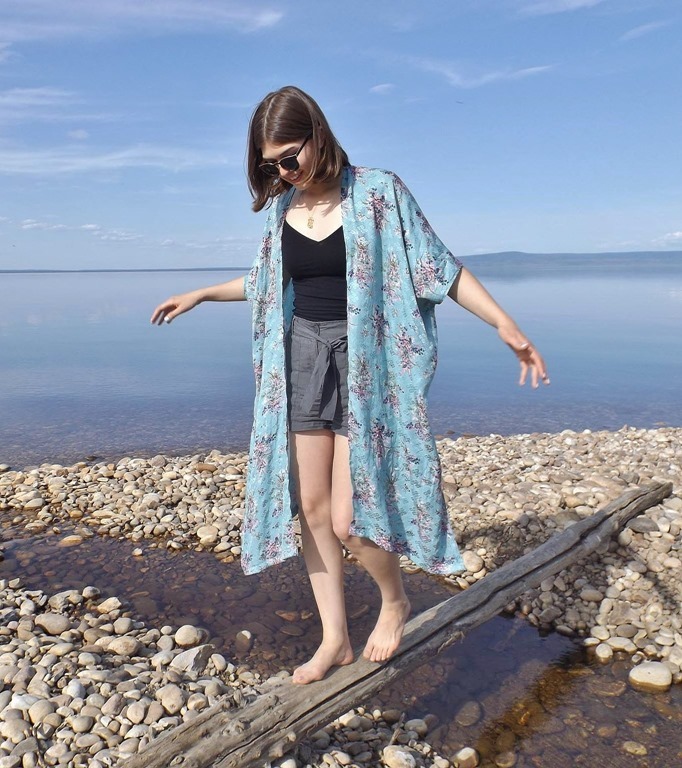 Even with hemming the edges this kimono is still a quick and easy sew! 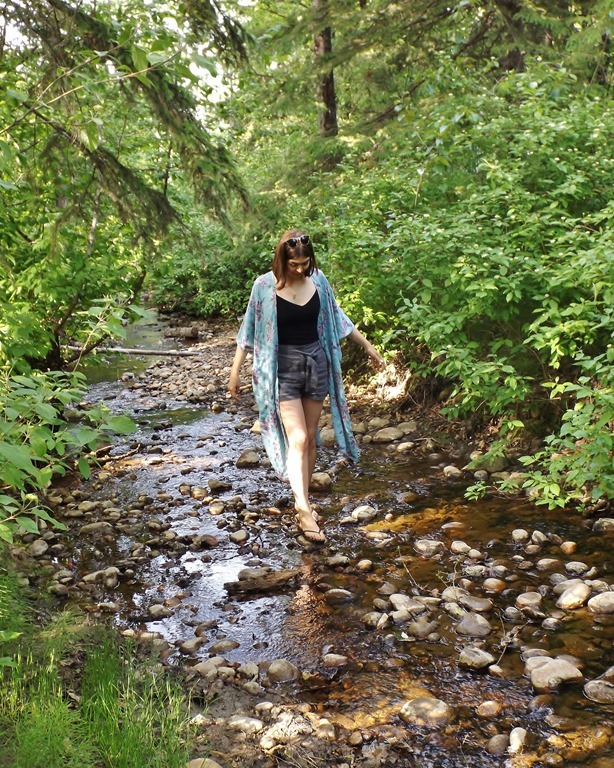 If your wondering how I made my first kimono check out my Cozy Kimono Cardigan tutorial. 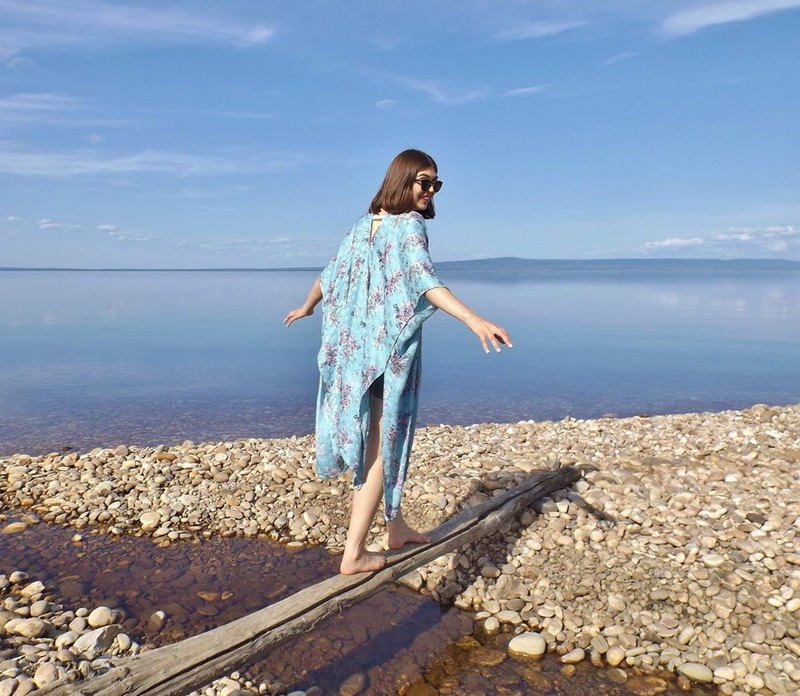 Thanks to Julianne Gutowski for taking these pretty photos of Halie modeling her kimono. Isn’t Lesser Slave Lake a beautiful location! Well last I checked it’s still winter. Yes, really! I’m not kidding you! I’m shocked too. It feels like its got to be at least March, but no, February just started. This DIY is pretty simple and you can do some of it, like sewing on the sequins, while sitting in front of a toasty fire with some hot cocoa! 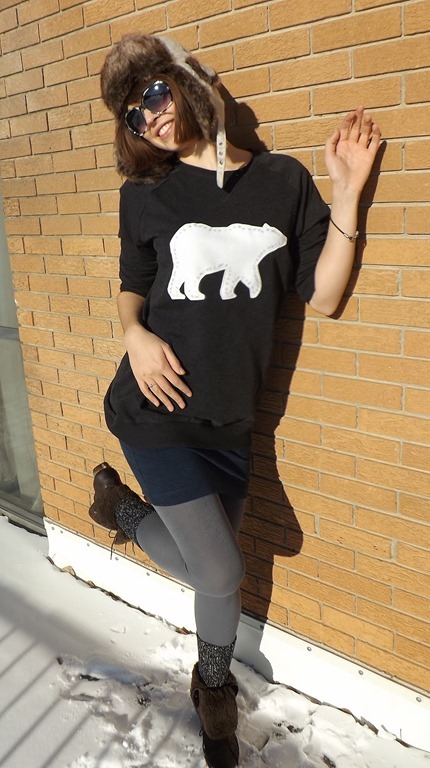 My sister Halie, who is also modeling the sweatshirts, and I were out shopping one day and admiring all the tops with animals on them. We’re both a fan of pretty much anything with a animal on it. This gave me the inspiration for a DIY we could do together, so off we went to H&M to buy some cheap sweatshirts. These oversized ones cost $19.95. First you need to pick an animal. Halie chose a fish and I picked a bear. Look up the silhouette of your animal of choice online and either use it as a reference to draw a pattern or increase the size and print it out. Just make sure it’s big enough but not bigger then your piece of felt. 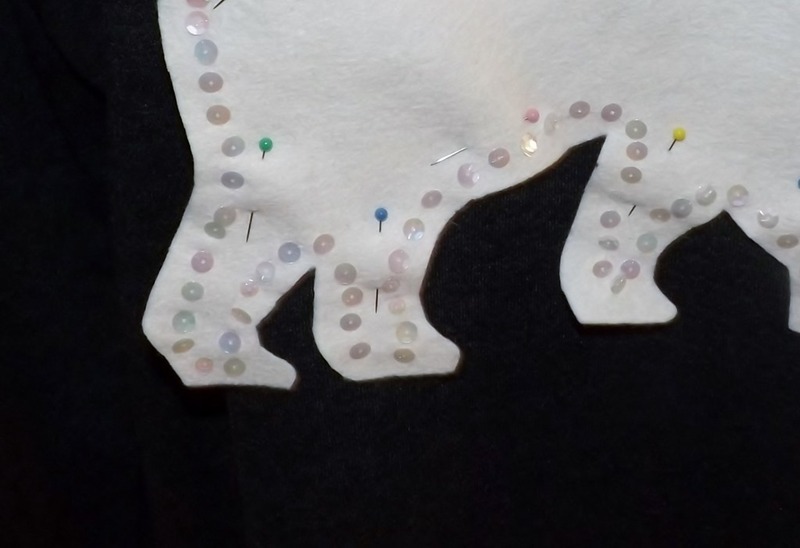 After cutting out your felt in the animal shape use the nylon thread to sew sequins all around the edge of the felt. 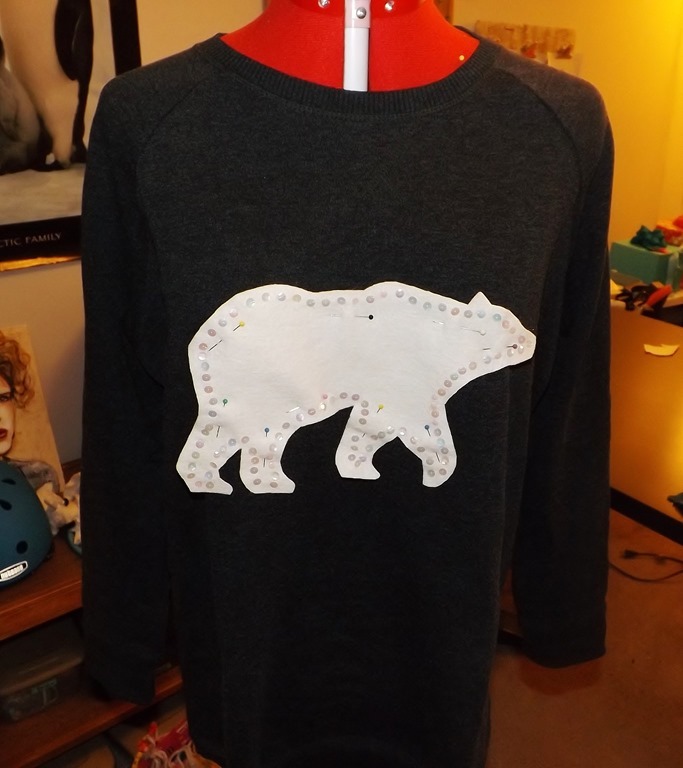 Stitch about a 1 cm from the edge so you have enough room to sew the felt to the sweatshirt. 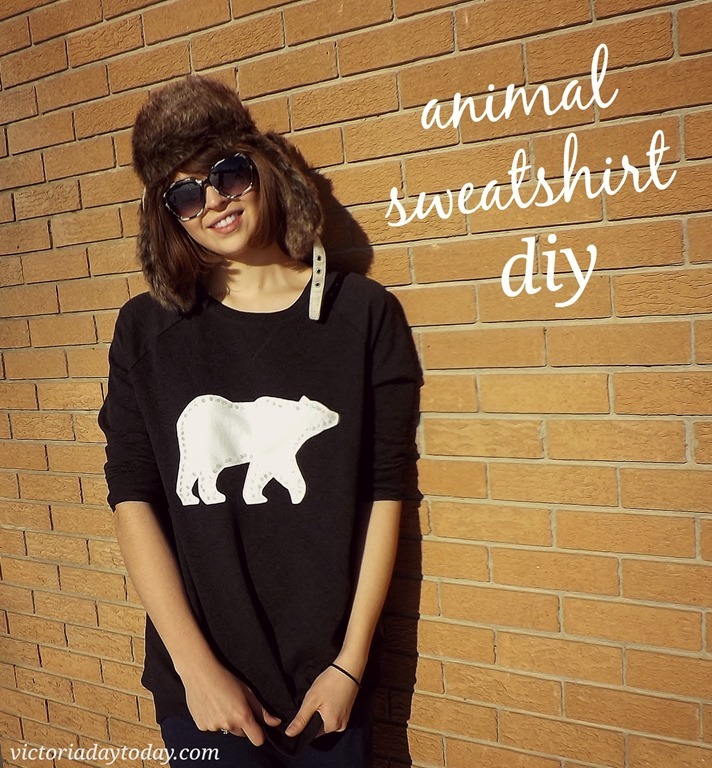 Once your done sewing the sequins on, pin your animal to the sweatshirt. I put the sweatshirt on a dress form to make sure I had it positioned properly. If you don’t have a dress form you might want to (carefully!) 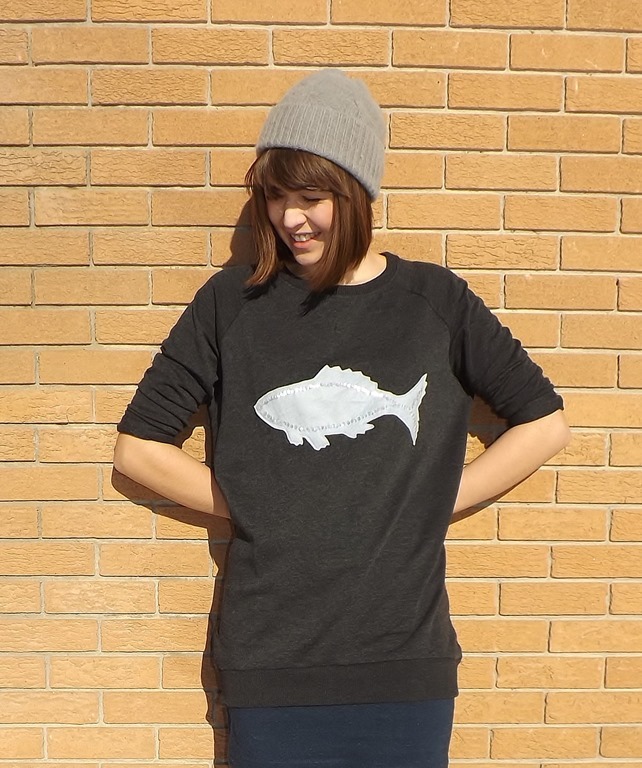 try on the sweatshirt to ensure it’s not crooked and adjust if needed. The last step is to take the thread that matches the felt and use the sewing machine to stitch between the sequins and edge of the felt. You could also do this by hand. I’ve washed and dried my shirt in the machine and it came out perfectly fine! 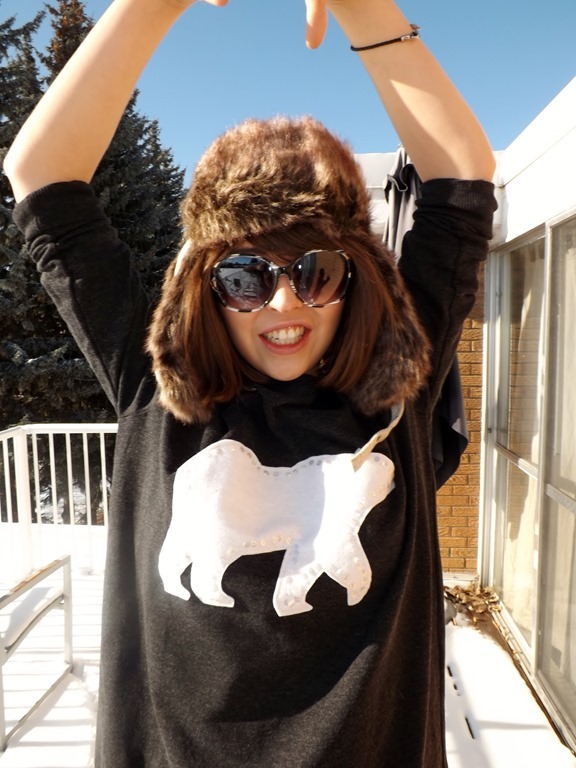 If your not into animals a large letter, varsity style, would also look snazzy on a sweatshirt! The sky’s the limit! 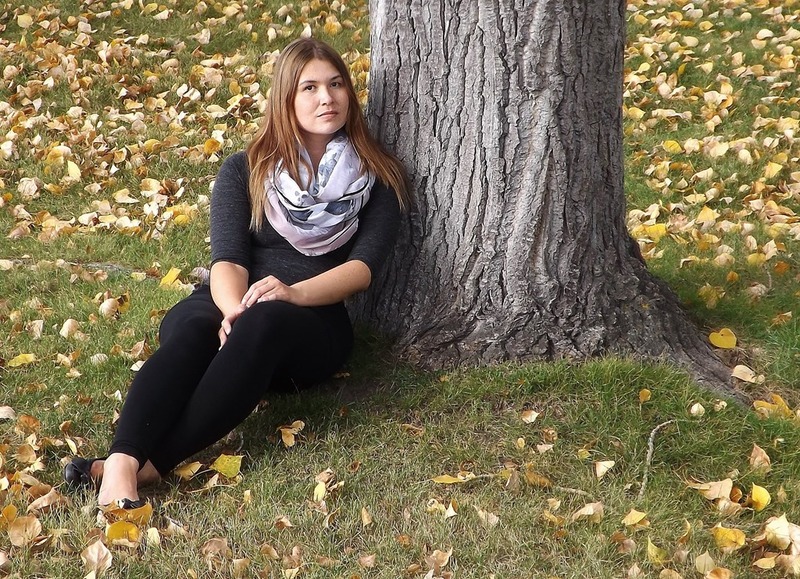 Fall is my favourite season. It’s when magazines are the thickest, you can start to get excited about Christmas, and best of all you get to layer! Hot summer days can be great but by September I just want to be able to wear a sweater and jacket without sweating like crazy. I saw a kimono cardigan in a store and loved it. It looked so simple yet cozy and fashionable so I figured I would try DIY’ing it. After dissecting the cardi at the store I realised it was made of 2 squares for the front and a rectangle for the back. Now the challenge was to figure out the correct measurements that would give enough drape without looking like I was wearing a sheet. After trial and error these are the measurements that looked the best on me. I’m 5’10” but my model Christa is a couple inches shorter and it works for both of us. Because the back piece is double the front pieces I only cut one 23”x23” square of paper and cut it on the fold for the back. 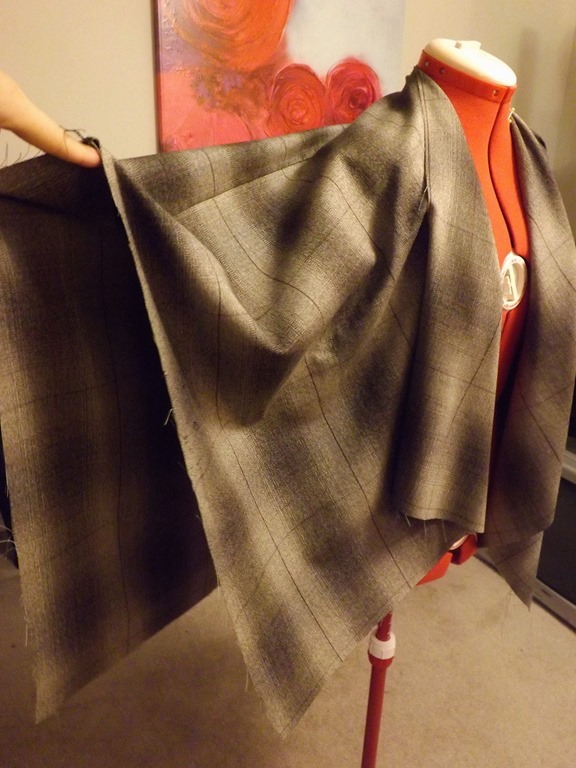 The best fabrics to use are light to mid weight because you want your cardi to drape nicely. 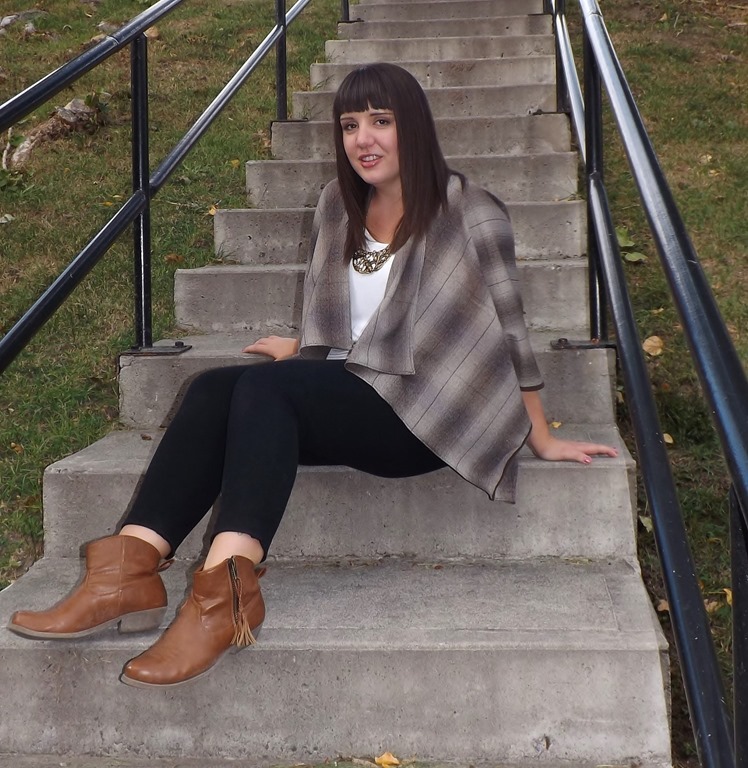 This plaid doesn’t have much stretch but I’ve also used a cotton jersey to make a kimono cardi and both turned out great. Keep in mind if your using a patterned fabric you might need more if you want to match up the pattern at the side seam and shoulders. 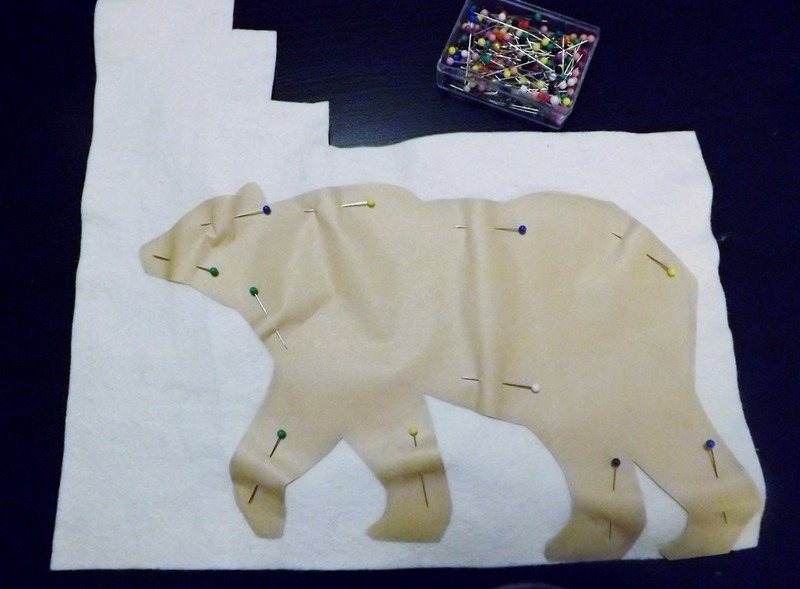 Once you cut out your three pieces, with right sides of the fabric facing each other, pin the shoulder seams together. Where the front pieces meet is where you neck goes. I’ve found it works best if you pin both the right and left side of the front to the back piece and sew it in one continuous line. 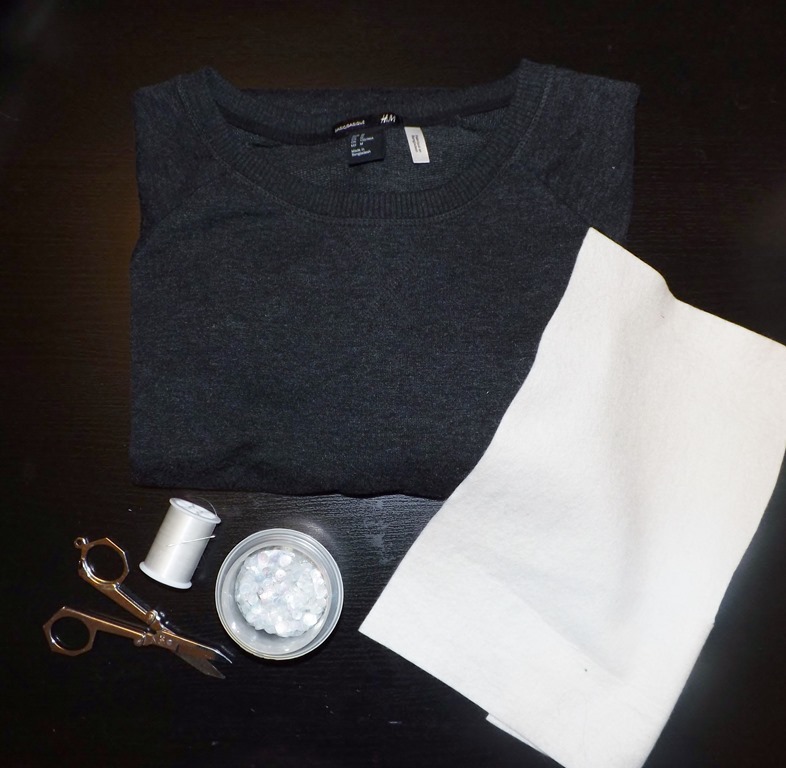 I used a serger to sew the shoulder seam but if you don’t have one you could use a french seam, pinking shears, or a zig zag stitch to finish the seam and keep the fabric from fraying. Using bias tape on the side seam and armholes is a easy way to finish the seam and add a nice feature. I made my own from micro suede. Before you sew the side seams you can try the cardi on and see how the drape is. If it’s too long or wide it would be easy at this stage to cut some off the bottom or sides. 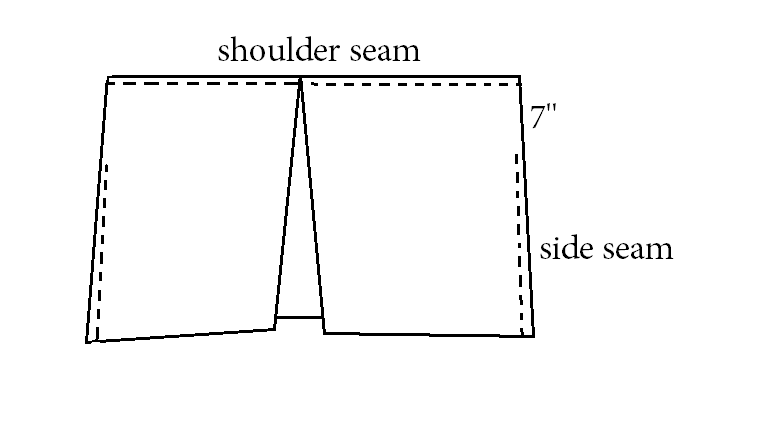 Measure 7” down each side staring at the shoulder seam. This will be the armhole. Sew the bias tape around the armhole. You’ll need about 15” of tape per armhole since you want there to be some overlap when you sew the side seam. Now pin the side seams with the wrong sides together and sew the bias tape from the bottom hem to about 1/2” over the armhole bias tape. 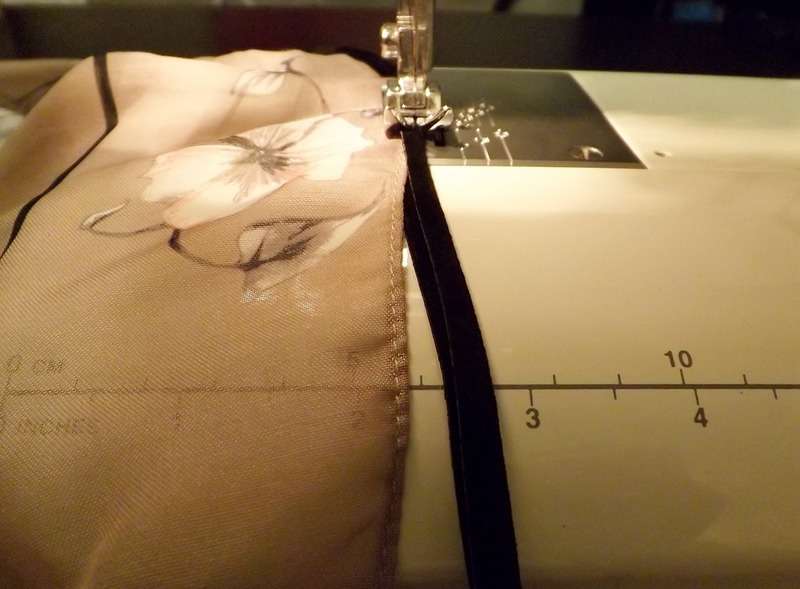 If your worried about the fabric slipping when sewing on the tape just do a basting stitch first. Then all you have to do is hem the bottom and up the center and your finished! After making the pattern this project took me about an hour to complete. Thanks to Christa for being such a great model! I love quick and easy projects! You can be cozying up in Kimono cardi in no time. 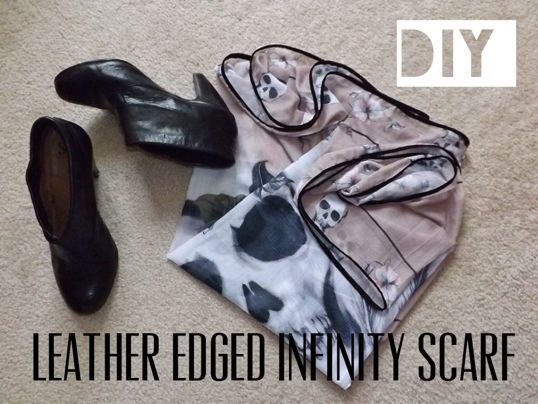 The inspiration for this infinity scarf came from one I saw in Le Chateau. It was all black and it looked pretty cool but I thought, I can do this for cheaper and use real leather not this fake looking stuff! 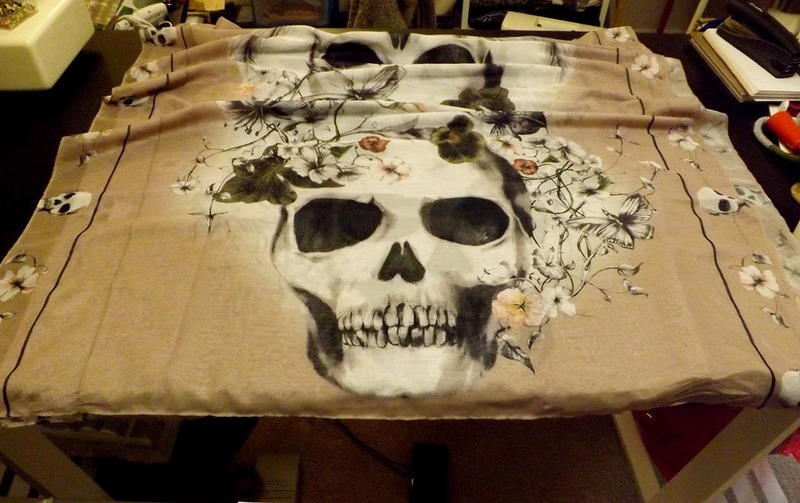 Earlier I had seen a beautiful rose colored skull scarf in H&M for $12.95 that I was on the fence about. 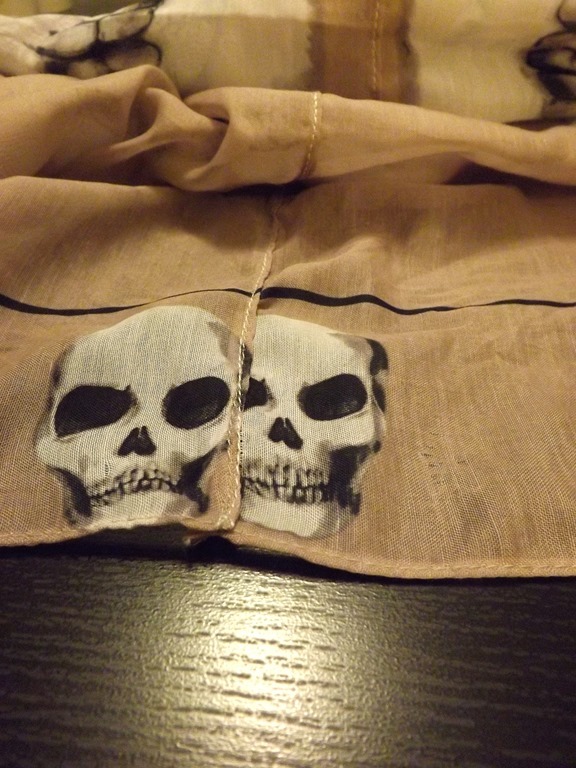 Now that I had a DIY project in mind this seemed like the perfect scarf to use. Sold! This is very simple and quick! First I sewed the two short ends of the scarf together to make it an infinity scarf. Since both ends are finished I placed one end on top of the other and stitched over the thread. I re-purposed the leather from a long jacket that I never wore and cut it into 1 1/2 cm strips. The good thing about leather or suede is you don’t have to worry about finishing the edge. I just folded each strip in half, ironed it down, and sewed it all around both edges sandwiching the scarf edge between the folded leather strip. Test your leather first to see if you should use a pressing cloth overtop as the iron can sometimes make the leather shiny. Bias tape would also look great and it comes in every color! 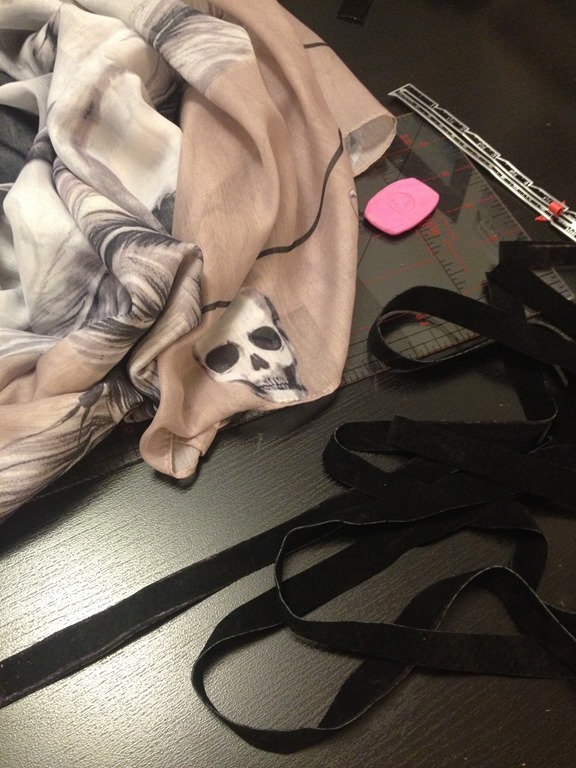 You can even make your own bias tape if you have some fabric that you like. I’ve been wearing this a lot! I think the black edging adds more dimension. I like the colors and it’s perfect for chilly, but not too chilly, fall weather.